Lego has been creeping its way into the architecture market for years now—see their Mies van der Rohe and Frank Lloyd Wright models for reference—but they've steered clear of building full-scale buildings based on the modular plastic bricks. No longer: today, the company unveiled designs for a visitor center that will open in 2016. And yes—it's very much a Lego building. The design hails from Bjarke Ingels Group, the powerhouse firm that originated in Copenhagen (today, BIG maintains a large New York office to deal with its forthcoming building on West 57th Street in New York). As you'll see in the video below, the plan is based on a stack of Lego—each containing a different programmatic void—with sculpted rooftops, each offering a different amenity. Inside, exhibits, shops, and play areas are expected to draw a quarter million visitors annually. The building will anchor a public plaza in Billund, Denmark, which enthusiasts will know as the birthplace of the toys—it's a Lego company town, of sorts. 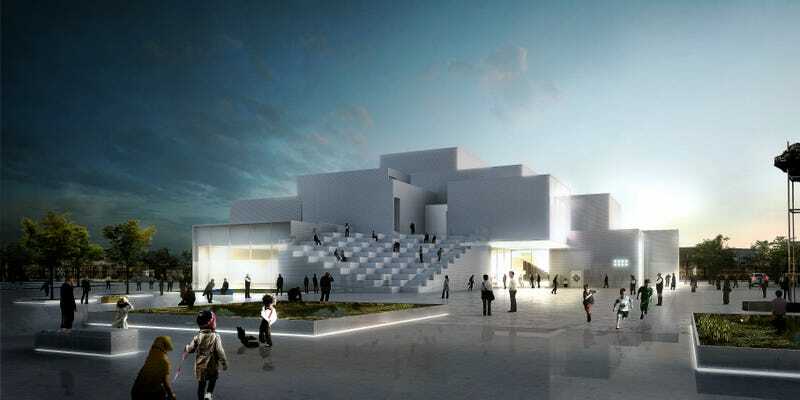 According to an interview with Architect Magazine, Ingels met with dozens of Lego superusers to conceive of the plan. "I've been meeting with these AFOLs [Adult Fans of Lego], and I've been learning quite a bit about Lego," he said. "It will be the best museum ever." Typical hyperbole from a hyperbolic architect—for reference, check out their plan for a massive corkscrew observation tower in downtown Phoenix. Or their plan to build a huge glass tank atop a World War II bunker. Or... You get the point.